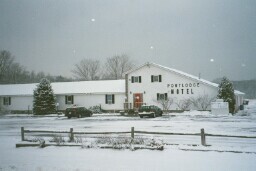 The Port Lodge motel is located on the Seaway Trail in beautiful Oswego County, New York and was built in the 1980's. Three additional buildings were added to the complex shortly after the original lodge was opened and a fifth building was added in 2000. We provide a total of forty-one clean spacious rooms. 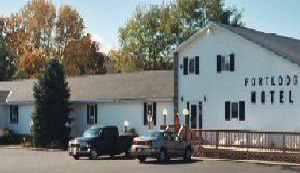 We are open year round and cater to every type of visitor. Our clientele includes sportsmen of all kinds, wedding and reunion parties as well as the weary traveler. Our facilities occupy eleven acres in a country setting offering a peaceful atmosphere. The grounds feature a large deck and pool area nestled behind the main lodge, barbeque pits, picnic tables, a child's play area, and horseshoe pits for our guests relaxation. Coffee maker and a microwave are available in the lobby, and free freezer space for your catch. An oversized parking lot provides room for boats, snowmobiles, trailers, and any other sport or travel related vehicles. Our rooms are configured with two, four, and five beds to accommodate groups of any size. Each room has a private bath, heat and air conditioning, cable television, phone service featuring free local and long distance (US/Canada) service and voice mail, a refrigerator, alarm clock (with battery backup), and a sitting area for your relaxation. We constantly strive to offer each of our guests with the best lodging value in the area and an enjoyable experience at our motel.